The basic technique of S-n-W quilts is knowing that all fabric has a repeat on it, much like wallpaper does. You measure off the repeat section and cut the fabric into identical sections (from selvage to selvage) until you have 8 sections. Depending on the depth of the repeat, this could involve a lot of fabric. You then stack the 8 sections on top of each other, doing your utmost to match the pattern designs in each section vertically ... that's the "Stack" part. Then, with your rotary cutter (boy, is that a toy which make life easier!) you cut the the pattern piece (either a triangle or diamond, depending on your pattern) ... that's the "Whack" part. 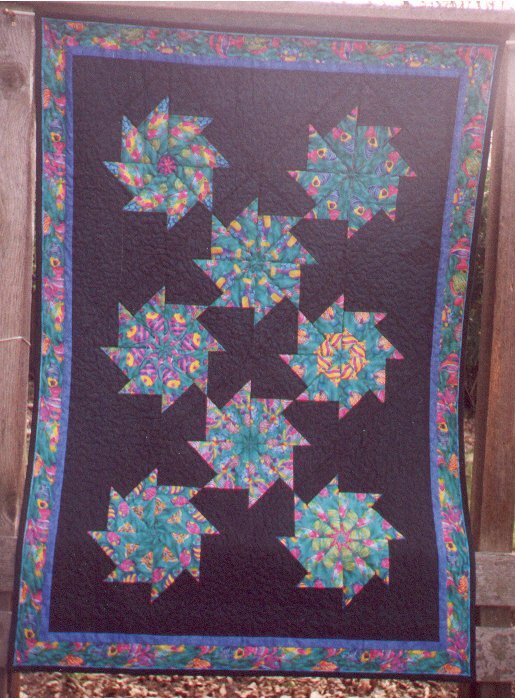 The result is 8 identical quilt pieces which you then sew together, forming a kaleidoscope-type effect. The results are gorgeous. The "magic" part is that you never, ever know ahead of time exactly what your repeats are going to look like, but you know it's going to be striking. The fabric I used for this quilt was originally bought for another project, but I had changed my mind. 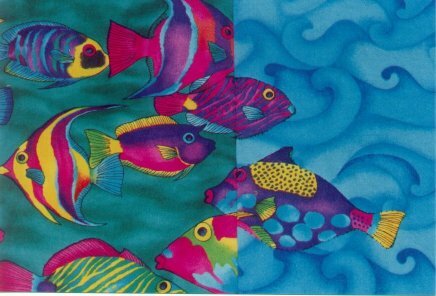 That left me with yards and yards and yards of this tropical-colored fishy fabric .. and my goodness ... what am I going do to do with it all? Well ... since the S-n-W quilt was kinda/sorta an experiment, why not use up part of the fishy fabric? Which is exactly what I did. 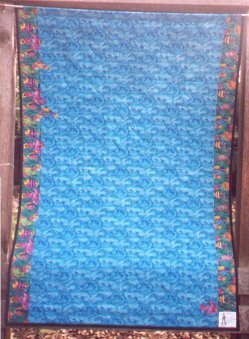 The backing of the quilt is a turquoise blue watery-effect wave motif, but even the full width of the fabric wasn't wide enough for the S-n-W top. What to do? Hmmm .. well, obviously one must expand the backing fabric. With what? Hmmm ... well, gosh, doncha know that because of the way you cut the repeats, you are left with tons and tons and tons of fabric left-over (one thing about S-n-W quilts ... they can tremendous fabric wasters, depending on how you cut them). So, I used the long vertical strips left from cutting the design repeats and sewed them to the watery fabric. Voilá! Now we had two long columns of fishies separated by a large body of water. That looked kinda neat ... but wait! there's more! Since I still had lots and lots and lots of fishy fabric left over, I then .. in a rare anally-retentive moment ... cut out bunches of little fishies to match up with the ones that had been cut in two when the seam was sewn. These were hand-appliqued on. The result was sooooooooooooo cute! Now I had some fishies swimming in and out of the back borders! Unfortunately, I didn't have a lot of the specific fishies that I needed; that's why there aren't a lot of them. In another departure from my usual sewing protocol ... I decided that I wanted to have it professionally quilted, instead of me doing the quilt-as-you-go thing. Although I was given a list of people, from our local quilt store, who did professional machine quilting, but when I called those listed, I discovered the list was horribly out of date. Some were no longer in business ... some numbers were no longer working .. and those that were left had an incredible lead-time requirement. One lady was taking orders 6 months in advance! Heck, I wanted it NOW! I eventually found a lady who was about 1/2 hour's drive from my house. I cruised over there, delivered the quilt and about 4 weeks later, cruised back over to pick it up. She did a wonderful job and I was very pleased with the effect and the results.